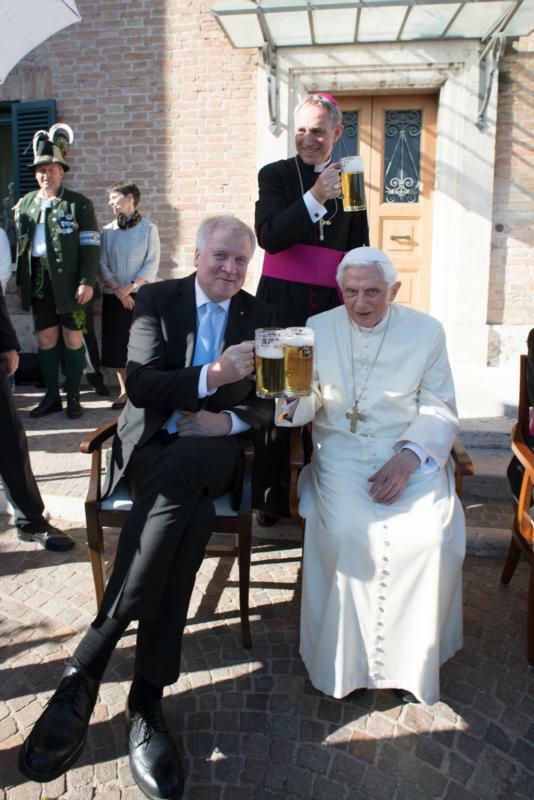 VATICAN CITY (CNS) — A bit of Bavaria, including German beer and pretzels, came to the Vatican to help celebrate retired Pope Benedict XVI’s 90th birthday. “Thank you for bringing Bavaria here,” he told his guests, commenting on the beauty of gathering together under a blue Roman sky with white clouds — colors that “recall the white and blue flag of Bavaria” and how “it’s always the same sky” no matter where one finds oneself in the world. The Bavarian-born pope’s birthday fell on Easter Sunday, April 16, so a small informal party was held April 17 outside his residence, the Mater Ecclesiae Monastery in the Vatican gardens. Pope Francis visited his predecessor April 12, before the start of the Easter Triduum, to offer him birthday greetings. Special guests at the Bavarian party included: Msgr. Georg Ratzinger, the retired pope’s 93-year-old brother; Archbishop Georg Ganswein, the retired pope’s personal secretary; Birgit Wansing, a longtime administrative assistant; and the consecrated laywomen from Memores Domini, who assist him. A German delegation was present, led by the minister president of Bavaria, Horst Seehofer, and including a group of men dressed in the traditional uniforms of the “Schutzen” with their dark green wool hats decorated with feathers, pins and springs of greenery. He thanked God for his beautiful homeland “that you now bring to me,” and which is “open to the world, lively and happy” because it is rooted so deeply in the Christian faith.